The early game has a bit of general flexibility in how it can play out. You can play like a typical Ravager build or play a control build using abilities to deal with any threats your opponent may present. 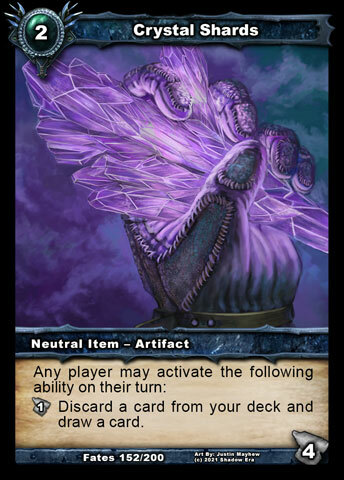 You really looking to try an establish a form of draw on turn 2, with Crystal Shard being the preferred early option because you can get some cards without a turn based resource cost and provides a potential outlet for Ravager Zealot should you need it. If your playing Ravager route early you typically want to play out the high health allies such as Cleric of the Asyn and Murderous Hulk since they have a greater chance of survival or require multiple cards to remove them which help save your HP as you attempt to transition to mid and late game. The mid game needs to begin focusing on getting Thriss Almanac set up. This is important piece to the end game combo so you want to make sure that this gets set up prior to portal for max effect. Once Thriss Almanac is in play you must begin to constantly think about your resources so that you can make sure it stays in play. Each of the allies in this build has a different utility when it comes to use through portal. Rapacious Vermin only cost 2cc, yet provides the most overall value to the end game Portal. Late game opponents typically have enough items/abilities to allow Rapacious Vermin’s ability to kick in, so he has the potential to trigger his summon ability to destroy an enemy controlled ability or item, boost his stats and swing for 5 attack. Murderous Hulk through Portal is awesome with Thriss Almanac in play. He can deal with 2 target (1 has to be an ally) 4 hp each for an amazing low cost of 5cc. Cleric of the Asyn has some really good potential too. Typically your resources will be high enough to combo with other allies same turn so you can really combo up the damage with him using some form of item/ability destruction. 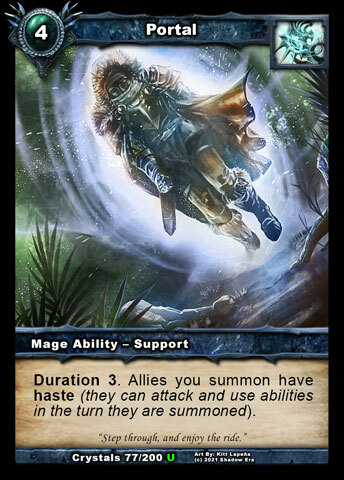 Additionally he can grow if opponent is expecting Portal and targets to destroy it on their turn. With Portal, Ravager Zealot does not have to trigger his summon ability and can swing free for 5 damage for 3cc. He also has the flexibility to achieve haste before and after portal to extend the haste theme. Ravager Zealot also combos with Cleric of the Asyn trying to combo some form of ability/item destruction (Crystal Shard). Obelisk of Echoes is also a good tool around this point of the game since you can generally kill opponents allies with your aggressive allies and assist with controlling your opponents tools. Slingblade Demon is just to add a slight bit of flexibility to our build. Ravagers can often get shut down with negative attachments so Slingblade can help free them up or just resetting any ally for a second swing through portal. 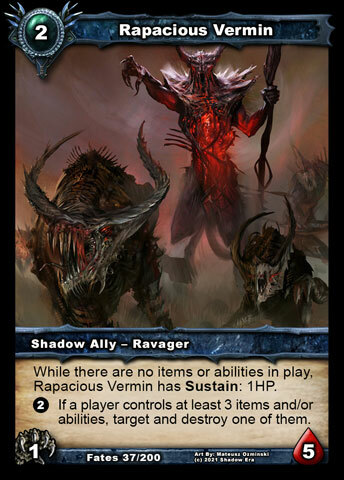 Essentially for 7 resources you can play Ravager Zealot, then Slingblade Demon, then Ravager Zealot again. If you happen to have Thriss Alamanac and Portal in play before performing this combo you are looking at 13 damage for an overall cost of 7cc. NOTE: Destroying a Portal removes Haste for any allies summoned but not yet attacked this turn. The draw for the deck is not a perfect fit but also a reason why I chose Majiya since her ability can help assist with drawing and board control. Currently there are 3 options to be considered. The first is Crystal Shard, which has the strength of not being a resource drain, but does have a discard feature which can hurt the combo nature of the tribe since every card is important for the combos. 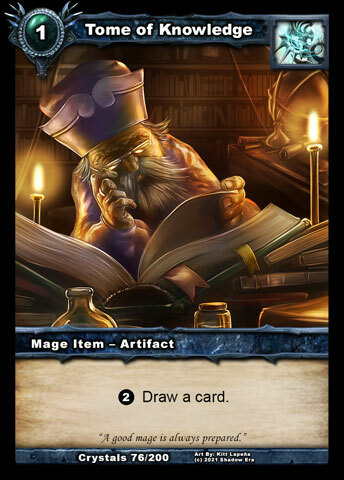 Tome of Knowledge has the strength of being able to be used on a per turn basis but has a resource cost which can prohibit plays because Thriss Almanac also requires resources on a per turn basis. Crystal Shard is a better option early, Tome of Knowledge is better option late once resources are high enough to maintain. Bad Santa is the 3rd option, which I believe is going to be a meta call. I would prefer to have a different option to all three of these but this is what is available to use currently. The deck has some weaknesses as well being very heavily dependent on resources and combos. The actual allies do not cost that much but because of Thriss Almanac and Tome of Knowledge you have a general resource upkeep every turn. The deck in general is very combo oriented, luckily there is some flexibility to the build in case your strategy needs to change. Thriss Demolitionist was in an earlier version but he has Plasma Behemoth syndrome in that his ability is hard to use on same turn summoned through portal due to the amount of resources needed to maximize this combo (8cc total). Tagged haste, item d, Majiya, Portal, Ravager, Shadow era, shattered fates, tribe. Great post – love this combo!